Most malware tries to compromise your systems by using a known vulnerability that the maker of the operating system has already patched. To help prevent malware from affecting your systems, two security best practices are to apply all operating system patches to your systems and actively monitor your systems for missing patches. In case you do need to recover from a malware attack, you should make regular backups of your data. In today’s blog post (Part 1 of a two-part post), I show how to keep your Amazon EC2 instances that run Microsoft Windows up to date with the latest security patches by using Amazon EC2 Systems Manager. Tomorrow in Part 2, I show how to take regular snapshots of your data by using Amazon EBS Snapshot Scheduler and how to use Amazon Inspector to check if your EC2 instances running Microsoft Windows contain any common vulnerabilities and exposures (CVEs). To follow along with the solution in this post, you need one or more EC2 instances. You may use existing instances or create new instances. For the blog post, I assume this is an EC2 for Microsoft Windows Server 2012 R2 instance installed from the Amazon Machine Images (AMIs). If you are not familiar with how to launch an EC2 instance, see Launching an Instance. I also assume you launched or will launch your instance in a private subnet. A private subnet is not directly accessible via the internet, and access to it requires either a VPN connection to your on-premises network or a jump host in a public subnet (a subnet with access to the internet). You must make sure that the EC2 instance can connect to the internet using a network address translation (NAT) instance or NAT gateway to communicate with Systems Manager and Amazon Inspector. The following diagram shows how you should structure your Amazon Virtual Private Cloud (VPC). 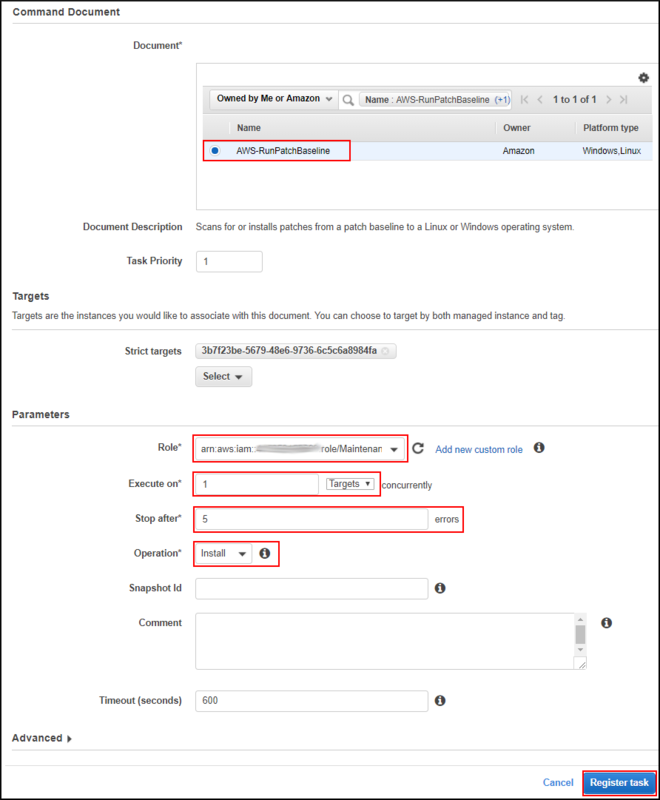 You should also be familiar with Restoring an Amazon EBS Volume from a Snapshot and Attaching an Amazon EBS Volume to an Instance. Later on, you will assign tasks to a maintenance window to patch your instances with Systems Manager. To do this, the AWS Identity and Access Management (IAM) user you are using for this post must have the iam:PassRole permission. This permission allows this IAM user to assign tasks to pass their own IAM permissions to the AWS service. In this example, when you assign a task to a maintenance window, IAM passes your credentials to Systems Manager. This safeguard ensures that the user cannot use the creation of tasks to elevate their IAM privileges because their own IAM privileges limit which tasks they can run against an EC2 instance. You should also authorize your IAM user to use EC2, Amazon Inspector, Amazon CloudWatch, and Systems Manager. You can achieve this by attaching the following AWS managed policies to the IAM user you are using for this example: AmazonInspectorFullAccess, AmazonEC2FullAccess, and AmazonSSMFullAccess. The following diagram illustrates the components of this solution’s architecture. For this blog post, Microsoft Windows EC2 is Amazon EC2 for Microsoft Windows Server 2012 R2 instances with attached Amazon Elastic Block Store (Amazon EBS) volumes, which are running in your VPC. These instances may be standalone Windows instances running your Windows workloads, or you may have joined them to an Active Directory domain controller. For instances joined to a domain, you can be using Active Directory running on an EC2 for Windows instance, or you can use AWS Directory Service for Microsoft Active Directory. Amazon EC2 Systems Manager is a scalable tool for remote management of your EC2 instances. You will use the Systems Manager Run Command to install the Amazon Inspector agent. The agent enables EC2 instances to communicate with the Amazon Inspector service and run assessments, which I explain in detail later in this blog post. You also will create a Systems Manager association to keep your EC2 instances up to date with the latest security patches. You can use the EBS Snapshot Scheduler to schedule automated snapshots at regular intervals. You will use it to set up regular snapshots of your Amazon EBS volumes. EBS Snapshot Scheduler is a prebuilt solution by AWS that you will deploy in your AWS account. With Amazon EBS snapshots, you pay only for the actual data you store. Snapshots save only the data that has changed since the previous snapshot, which minimizes your cost. You will use Amazon Inspector to run security assessments on your EC2 for Windows Server instance. In this post, I show how to assess if your EC2 for Windows Server instance is vulnerable to any of the more than 50,000 CVEs registered with Amazon Inspector. Launch an EC2 instance with an IAM role, Amazon EBS volume, and tags that Systems Manager and Amazon Inspector will use. Take EBS snapshots by using EBS Snapshot Scheduler to automate snapshots based on instance tags. Create an IAM role for Systems Manager before launching your EC2 instance. Launch your EC2 instance with Amazon EBS and the IAM role for Systems Manager. Add tags to instances so that you can automate policies for which instances you take snapshots of and when. Before launching your EC2 instance, I recommend that you first create an IAM role for Systems Manager, which you will use to update the EC2 instance you will launch. AWS already provides a preconfigured policy that you can use for your new role, and it is called AmazonEC2RoleforSSM. Sign in to the IAM console and choose Roles in the navigation pane. Choose Create new role. In the role-creation workflow, choose AWS service > EC2 > EC2 to create a role for an EC2 instance. Choose the AmazonEC2RoleforSSM policy to attach it to the new role you are creating. 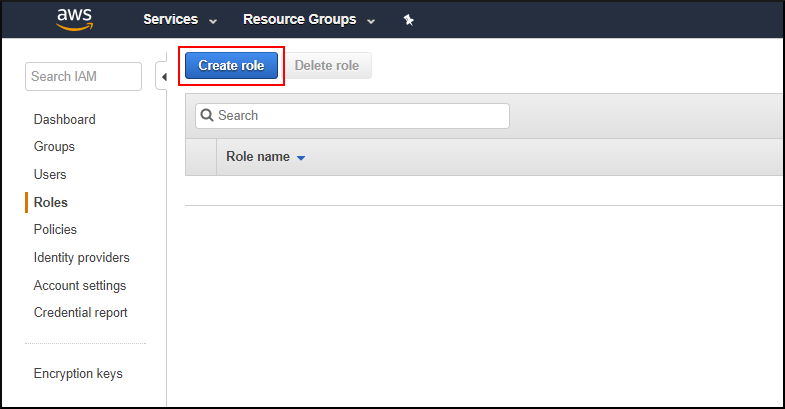 Give the role a meaningful name (I chose EC2SSM) and description, and choose Create role. To follow along, you need an EC2 instance that is running Microsoft Windows Server 2012 R2 and that has an Amazon EBS volume attached. You can use any existing instance you may have or create a new instance. The operating system is Microsoft Windows Server 2012 R2. You attach at least one Amazon EBS volume to the EC2 instance. 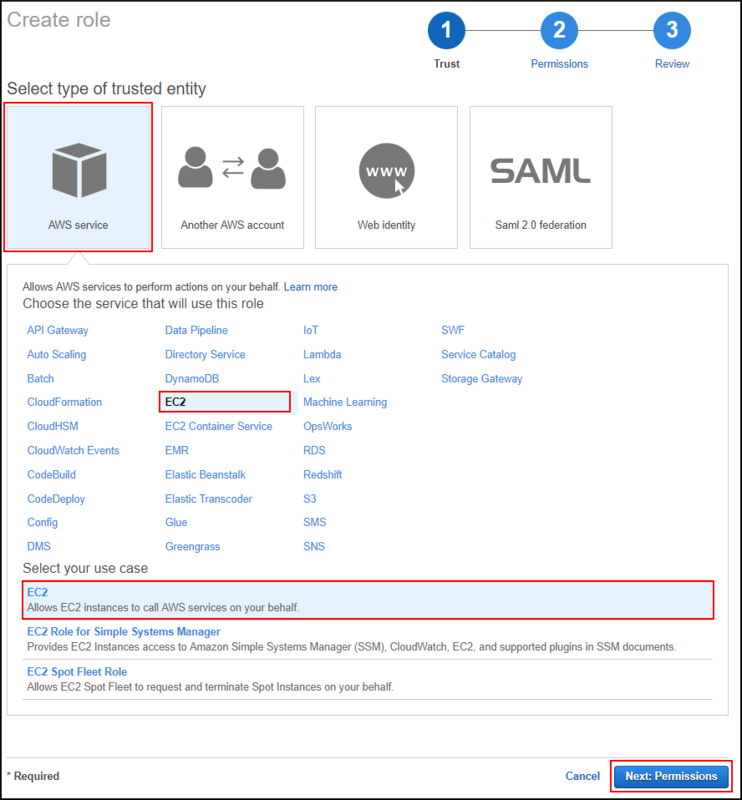 You attach the newly created IAM role (EC2SSM). The EC2 instance can connect to the internet through a network address translation (NAT) gateway or a NAT instance. You create the tags shown in the following screenshot (you will use them later). If you are using an already launched EC2 instance, you can attach the newly created role as described in Easily Replace or Attach an IAM Role to an Existing EC2 Instance by Using the EC2 Console. The final step of configuring your EC2 instances is to add tags. You will use these tags to configure Systems Manager in Step 2 of this blog post and to configure Amazon Inspector in Part 2. For this example, I add a tag key, Patch Group, and set the value to Windows Servers. I could have other groups of EC2 instances that I treat differently by having the same tag key but a different tag value. For example, I might have a collection of other servers with the Patch Group tag key with a value of IAS Servers. Note: You must wait a few minutes until the EC2 instance becomes available before you can proceed to the next section. At this point, you now have at least one EC2 instance you can use to configure Systems Manager, use EBS Snapshot Scheduler, and use Amazon Inspector. Note: If you have a large number of EC2 instances to tag, you may want to use the EC2 CreateTags API rather than manually apply tags to each instance. In this section, I show you how to use Systems Manager to apply operating system patches to your EC2 instances, and how to manage patch compliance. Create the Systems Manager IAM role so that Systems Manager is able to perform patch operations. 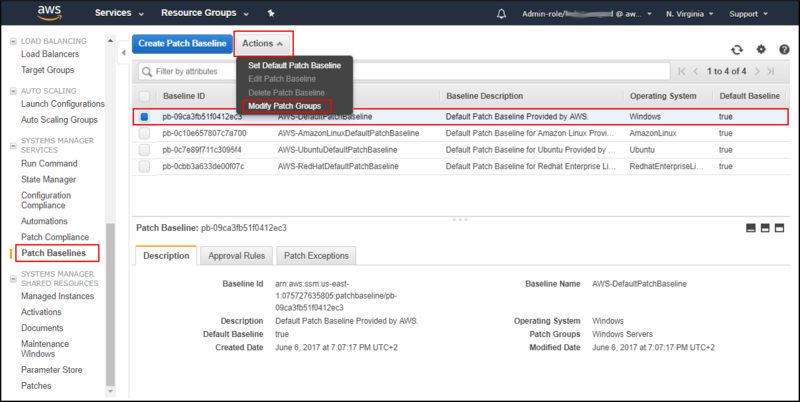 Associate a Systems Manager patch baseline with your instance to define which patches Systems Manager should apply. Define a maintenance window to make sure Systems Manager patches your instance when you tell it to. Monitor patch compliance to verify the patch state of your instances. Systems Manager is a collection of capabilities that helps you automate management tasks for AWS-hosted instances on EC2 and your on-premises servers. In this post, I use Systems Manager for two purposes: to run remote commands and apply operating system patches. To learn about the full capabilities of Systems Manager, see What Is Amazon EC2 Systems Manager? Patch management is an important measure to prevent malware from infecting your systems. Most malware attacks look for vulnerabilities that are publicly known and in most cases are already patched by the maker of the operating system. These publicly known vulnerabilities are well documented and therefore easier for an attacker to exploit than having to discover a new vulnerability. Patches for these new vulnerabilities are available through Systems Manager within hours after Microsoft releases them. There are two prerequisites to use Systems Manager to apply operating system patches. First, you must attach the IAM role you created in the previous section, EC2SSM, to your EC2 instance. Second, you must install the Systems Manager agent on your EC2 instance. If you have used a recent Microsoft Windows Server 2012 R2 AMI published by AWS, Amazon has already installed the Systems Manager agent on your EC2 instance. You can confirm this by logging in to an EC2 instance and looking for Amazon SSM Agent under Programs and Features in Windows. 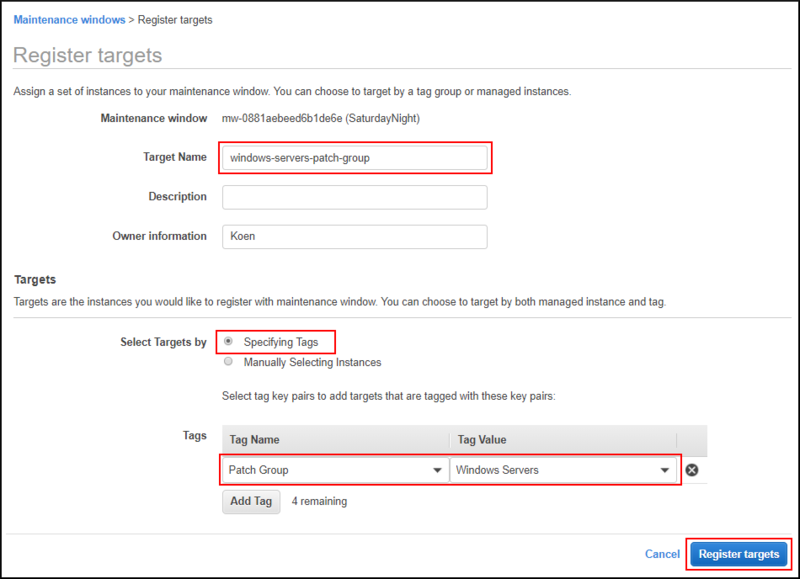 To install the Systems Manager agent on an instance that does not have the agent preinstalled or if you want to use the Systems Manager agent on your on-premises servers, see the documentation about installing the Systems Manager agent. If you forgot to attach the newly created role when launching your EC2 instance or if you want to attach the role to already running EC2 instances, see Attach an AWS IAM Role to an Existing Amazon EC2 Instance by Using the AWS CLI or use the AWS Management Console. To make sure your EC2 instance receives operating system patches from Systems Manager, you will use the default patch baseline provided and maintained by AWS, and you will define a maintenance window so that you control when your EC2 instances should receive patches. 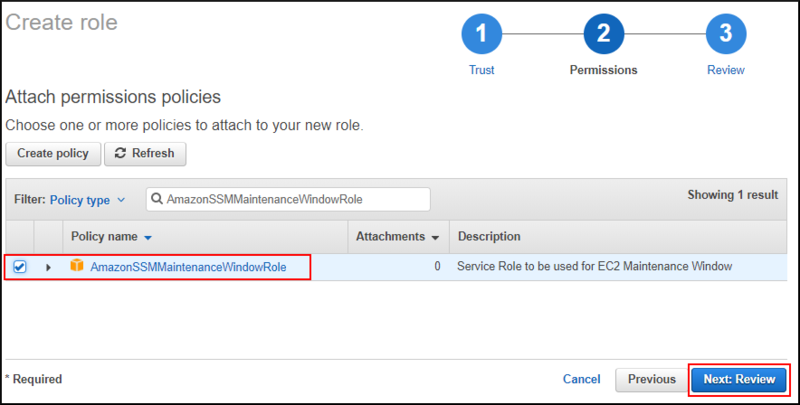 For the maintenance window to be able to run any tasks, you also must create a new role for Systems Manager. This role is a different kind of role than the one you created earlier: Systems Manager will use this role instead of EC2. 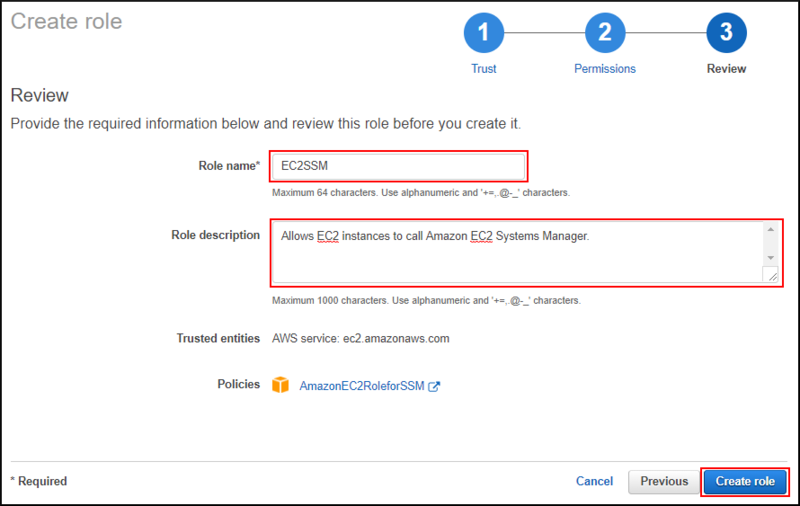 Earlier we created the EC2SSM role with the AmazonEC2RoleforSSM policy, which allowed the Systems Manager agent on our instance to communicate with the Systems Manager service. Here we need a new role with the policy AmazonSSMMaintenanceWindowRole to make sure the Systems Manager service is able to execute commands on our instance. To create the new IAM role for Systems Manager, follow the same procedure as in the previous section, but in Step 3, choose the AmazonSSMMaintenanceWindowRole policy instead of the previously selected AmazonEC2RoleforSSM policy. Finish the wizard and give your new role a recognizable name. For example, I named my role MaintenanceWindowRole. By default, only EC2 instances can assume this new role. You must update the trust policy to enable Systems Manager to assume this role. Navigate to the IAM console and choose Roles in the navigation pane. Choose MaintenanceWindowRole and choose the Trust relationships tab. Then choose Edit trust relationship. Update the policy document by copying the following policy and pasting it in the Policy Document box. As you can see, I have added the ssm.amazonaws.com service to the list of allowed Principals that can assume this role. Choose Update Trust Policy. Next, you are going to associate a Systems Manager patch baseline with your EC2 instance. A patch baseline defines which patches Systems Manager should apply. You will use the default patch baseline that AWS manages and maintains. Before you can associate the patch baseline with your instance, though, you must determine if Systems Manager recognizes your EC2 instance. Go to the EC2 console and verify your instance is running. Select your instance and confirm you attached the Systems Manager IAM role, EC2SSM. Make sure that you deployed a NAT gateway in your public subnet to ensure your VPC reflects the diagram at the start of this post so that the Systems Manager agent can connect to the Systems Manager internet endpoint. Check the Systems Manager Agent logs for any errors. Choose Patch Baselines under Systems Manager Services in the navigation pane of the EC2 console. Choose the default patch baseline as highlighted in the following screenshot, and choose Modify Patch Groups in the Actions drop-down. 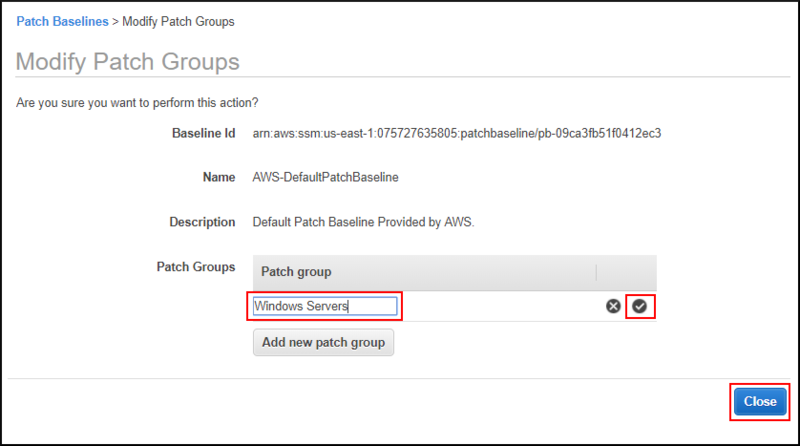 In the Patch group box, enter the same value you entered under the Patch Group tag of your EC2 instance in “Step 1: Configure your EC2 instance.” In this example, the value I enter is Windows Servers. Choose the check mark icon next to the patch group and choose Close. Now that you have successfully set up a role and have associated a patch baseline with your EC2 instance, you will define a maintenance window so that you can control when your EC2 instances should receive patches. By creating multiple maintenance windows and assigning them to different patch groups, you can make sure your EC2 instances do not all reboot at the same time. The Patch Group resource tag you defined earlier will determine to which patch group an instance belongs. 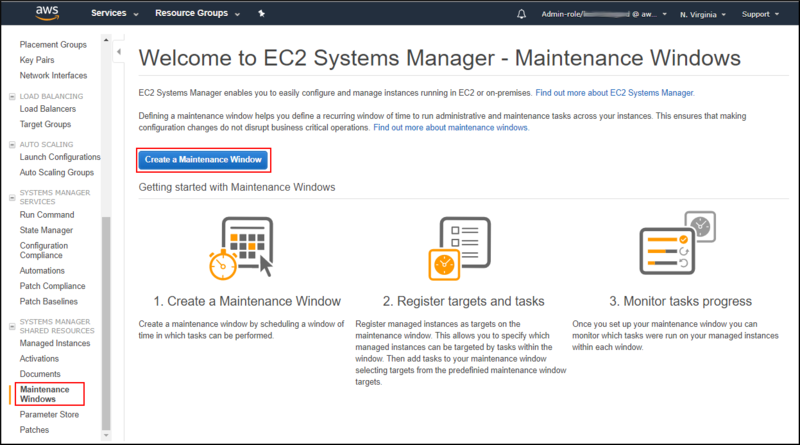 Navigate to the EC2 console, scroll down to Systems Manager Shared Resources in the navigation pane, and choose Maintenance Windows. Choose Create a Maintenance Window. Select the Cron schedule builder to define the schedule for the maintenance window. In the example in the following screenshot, the maintenance window will start every Saturday at 10:00 P.M. UTC. To specify when your maintenance window will end, specify the duration. In this example, the four-hour maintenance window will end on the following Sunday morning at 2:00 A.M. UTC (in other words, four hours after it started). Systems manager completes all tasks that are in process, even if the maintenance window ends. In my example, I am choosing to prevent new tasks from starting within one hour of the end of my maintenance window because I estimated my patch operations might take longer than one hour to complete. Confirm the creation of the maintenance window by choosing Create maintenance window. After creating the maintenance window, you must register the EC2 instance to the maintenance window so that Systems Manager knows which EC2 instance it should patch in this maintenance window. To do so, choose Register new targets on the Targets tab of your newly created maintenance window. You can register your targets by using the same Patch Group tag you used before to associate the EC2 instance with the AWS-provided patch baseline. Open Maintenance Windows in the EC2 console, select your previously created maintenance window, choose the Tasks tab, and choose Register run command task from the Register new task drop-down. Choose the AWS-RunPatchBaseline document from the list of available documents. For Role, choose the role you created previously (called MaintenanceWindowRole). For Execute on, specify how many EC2 instances Systems Manager should patch at the same time. If you have a large number of EC2 instances and want to patch all EC2 instances within the defined time, make sure this number is not too low. For example, if you have 1,000 EC2 instances, a maintenance window of 4 hours, and 2 hours’ time for patching, make this number at least 500. For Stop after, specify after how many errors Systems Manager should stop. For Operation, choose Install to make sure to install the patches. Now, you must wait for the maintenance window to run at least once according to the schedule you defined earlier. 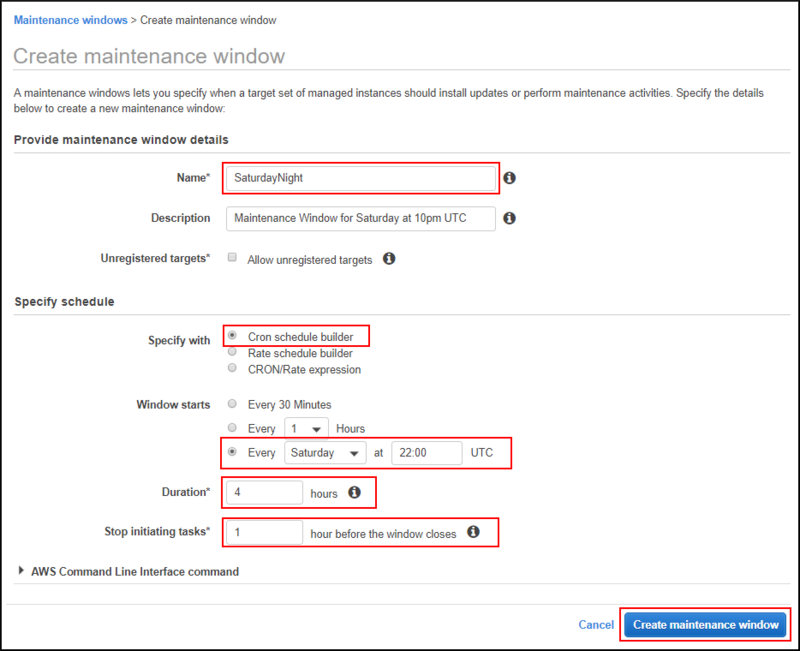 Note that if you don’t want to wait, you can adjust the schedule to run sooner by choosing Edit maintenance window on the Maintenance Windows page of Systems Manager. If your maintenance window has expired, you can check the status of any maintenance tasks Systems Manager has performed on the Maintenance Windows page of Systems Manager and select your maintenance window. 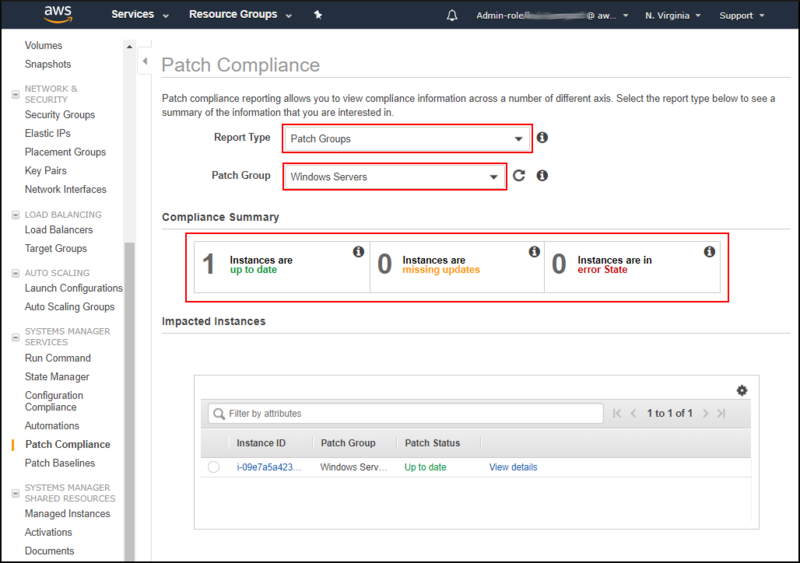 You also can see the overall patch compliance of all EC2 instances that are part of defined patch groups by choosing Patch Compliance under Systems Manager Services in the navigation pane of the EC2 console. You can filter by Patch Group to see how many EC2 instances within the selected patch group are up to date, how many EC2 instances are missing updates, and how many EC2 instances are in an error state. In this section, you have set everything up for patch management on your instance. Now you know how to patch your EC2 instance in a controlled manner and how to check if your EC2 instance is compliant with the patch baseline you have defined. Of course, I recommend that you apply these steps to all EC2 instances you manage. In Part 1 of this blog post, I have shown how to configure EC2 instances for use with Systems Manager, EBS Snapshot Scheduler, and Amazon Inspector. I also have shown how to use Systems Manager to keep your Microsoft Windows–based EC2 instances up to date. In Part 2 of this blog post tomorrow, I will show how to take regular snapshots of your data by using EBS Snapshot Scheduler and how to use Amazon Inspector to check if your EC2 instances running Microsoft Windows contain any CVEs. If you have comments about this post, submit them in the “Comments” section below. If you have questions about or issues implementing this solution, start a new thread on the EC2 forum or the Amazon Inspector forum, or contact AWS Support.